I was a theatre actress for a number of years. Preparations for shows involved me talking out loud for weeks on end with various accents and voices as I tried to find the essence of my character and memorize lines. It wasn’t unusual for someone to catch me in the act of reciting lines on the bus or while out for a walk. I’ve become an expert on talking out loud, which is why my occupational therapist thought it would be a good idea for me to try voice dictation. As a writer, it can be challenging to type every day. Arthritis can be hard on the hands, and some days it can be difficult to write. A few months back, I was asked by one of my readers if I’d ever used voice technology – at the time I hadn’t but she planted the seed in my head. I can’t let the failure of my hands stop me from doing my work, and so I agreed to try a session of voice technology. My occupational therapist set up an appointment with the technology department at a nearby rehabilitation center. I met her outside a room that contained a variety of computers, printers and several other devices I’d never seen. I sat down with the technology team and they talked with me about my needs and what I wanted from the session. In the end it was decided I should explore a couple of different techniques. I would try a built-in program on my computer and a speech program called Dragon, commonly used in doctors’ offices for dictating letters. I tried both programs, knowing full well that I would be limited to one, as my tablet did not have the capacity for downloading programs. The technician set up the computer, sat me down, and placed some soft headphones over my ears. A tiny microphone stuck out from one side of the headpiece and she adjusted it in front of my mouth. I felt a bit like a radio broadcaster, although my voice was going nowhere but into the computer. I was surprised to discover that, in spite of all the talking I do all day, it was a bit unnerving to suddenly have to talk to this tiny device in front of my mouth. To help me get over my awkwardness, I was given written phrases and dialogue to read. I was hesitant at first, speaking slowly and softly, trying to get accustomed to this new way of writing. It was fascinating to watch my words pop up on the screen as I dictated. I noticed the computer deciphered some words incorrectly, but I was assured the program would improve as the computer learned to recognize the articulation and rhythm of my voice. It was slow going as I struggled through the technique of learning how to correct words, change phrases, and add punctuation all with the sound of my voice. I had to be very specific and patient. It took some time to find the right tempo to speak to the computer. I was used to my speedy fingers flying over the keyboard, and this was a bit more laborious, but once it began to identify the rhythm of my voice, it picked up speed. 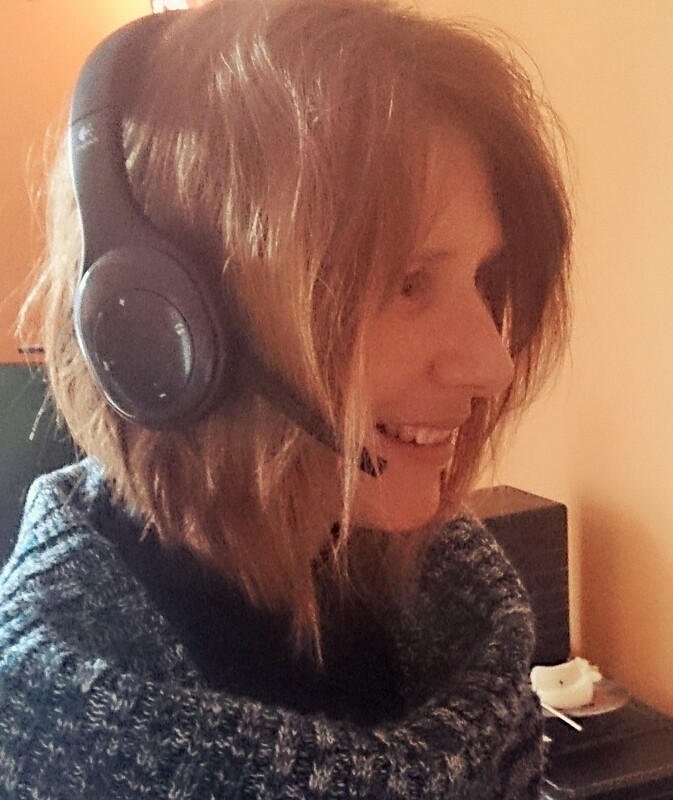 I recently purchased my own headset with microphone and opened my speech recognition program on my tablet. It took some time, but I created this post with just my voice – although not without its challenges – reading the first draft made me wonder what language I was speaking, and I had to do some editing to make it clear. It takes time and patience to use voice dictation, but if I’m not on an urgent deadline, I enjoy having the option of giving my hands a break every once in a while – I also love the added benefit of being able to stand, stretch and walk around my room while I work. It frees me from the “sitting duck” syndrome, and stimulates my mind and body. Like with any new technology, it will take some time for me, my microphone and my computer to really get to know one another, but as long my tongue holds out, I’m confident we’ll get along just fine. That’s a beautiful picture accompanied by a wonderful story. Thank you. I see you’ve been keeping busy 😉 Keep up the great work. Cheers. Mhm I like keeping busy. Hope you’re doing well. All the best! That is so cool! Sometimes I wish I had a stenographer at my side. The thoughts come fast and loose. It should be fun getting to know and use this program. Irma, it’s wonderful. Especially when the thoughts come too fast for the hands to keep up. However, you may notice when you go back that you might have to tweak a word or two, but it’s great to be able to just talk out the ideas. Hope you are staying well and enjoying life. X.
I use Dragon at work and at home. I find it hard to compose as I dictate, so I only use it for “long-form” documents. I won’t use it for a quick e-mail or IM session. Unless, of course, the pain in my hands won’t allow it! Otherwise I compose a draft in longhand (I use fountain pens. Much better than ball-points) and then dictate it into Word. Once I “trained” the program, I found the error rate to be much lower than my (horrible) typing! Yes, I am finding training my program takes some time, but I am slowly getting used to it. And I often compose things out loud as I’m musing, and I love the idea of catching those ideas in the moment rather than waiting until I can dig up a pen or a computer :). Of course, I have to hope those moments come when I’m using my program 🙂 Thanks for sharing your experience. Wishing you well. Cheers. J.G.